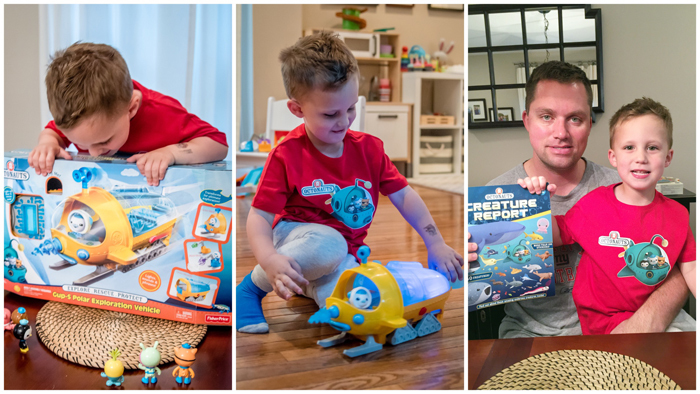 As Noah gets older, I can't help but be excited about the boy he's becoming and all the cool new things he's learning. But at the same time, I want to slow time down and keep him little forever. 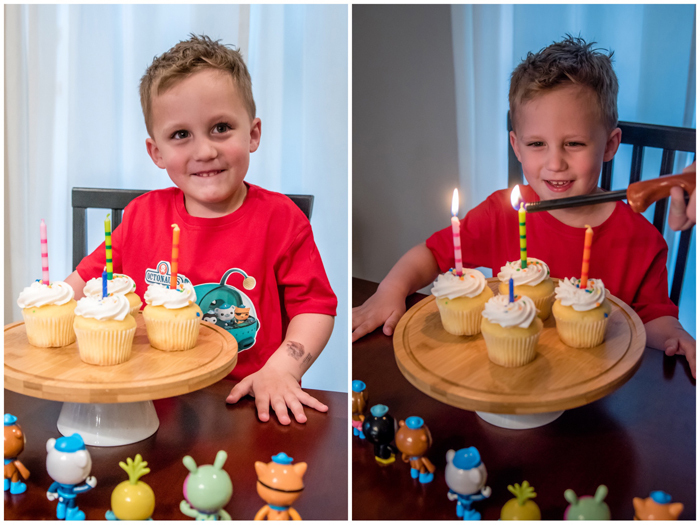 Recently he thinks it's funny to tell me he's already 4. Every time I tell him "Not yet! Slow down!". I also joke with him that he has to stay 3 forever ;) There's just something about 4 that seems so old. Definitely no longer a baby, or even a toddler. 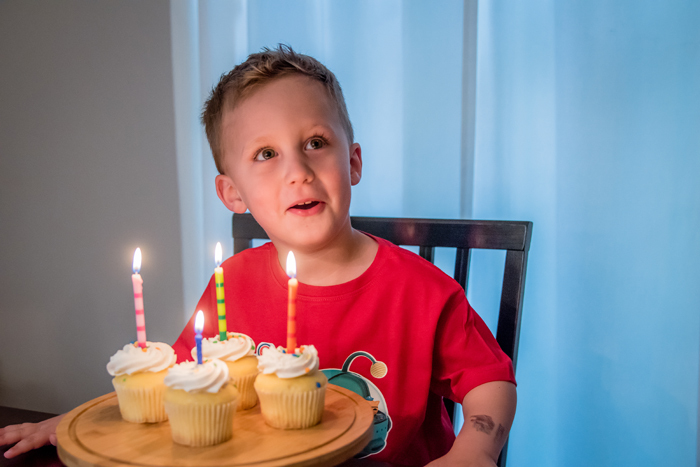 At 4, he becomes a bona fide kid! So I guess I have the next 6 months to wrap my head around being the mom of an actual kid! Just like I did for the last update, I re-read it to see how Noah has changed, and how he's stayed the same. This time, while his height and weight hasn't changed as much, he's grown leaps and bounds in so many other areas! The biggest things are that he's just more physically able now AND that he's now talking... non stop. It's hard to remember that he was a little late in the speech department! And in case you care about all this stuff, here are all the details of Noah at age 3 1/2! Every 6 months we mark Noah's height on our growth chart (similar)... it's so fun to watch him grow! 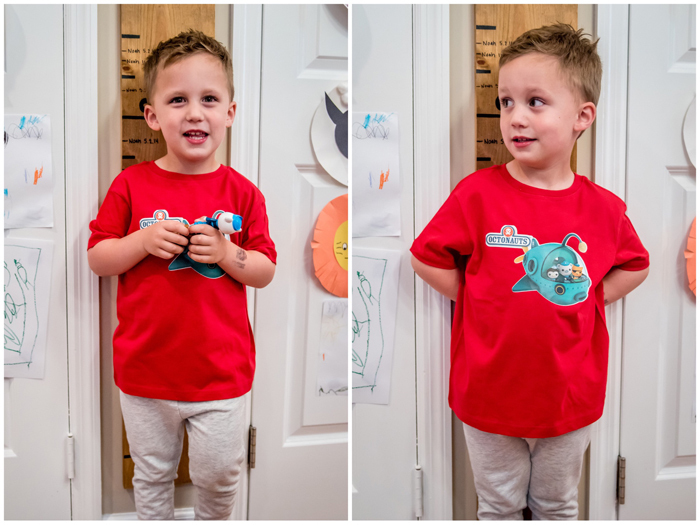 Our good friend, Ken, made this amazing Octonauts shirt for Noah! We (as well as his teacher) think it's pretty safe to say he's a lefty. He writes, draws, and paints with his left hand. He does use his right hand for scissors and I've noticed he kicks the soccer ball more with his right foot, but that's about it. He loves riding his big wheel. He's really fast on it and pretty good at steering. He loves to run, jump (two feet, still working on hopping on one foot), and gallop. Just recently he's become a whole new kid on the playground. He used to be scared of slides but now goes down the small ones at least! He's also mastered climbing up ladders and can even do the more complicated ones. Will hold his breath and put his face in the water! Can climb into his car seat on his own finally! He can put on his own coat and take it off. He's able to put on his own shoes but often requests I still do it for him. He takes off his coat and shoes when he gets home from school and puts them away. He is able to take off his clothes, but still struggles putting a shirt on without help. He's a little slow at taking off his pants, so if he really needs to use the bathroom he prefers I help him. Noah now sits in a regular chair all the time... we finally got rid of the high chair! Can navigate the iPad like a pro! Knows all his letters now. One of his favorite thing to do is sing the ABC song. He can identify all his uppercase letters and we are now working on the lowercase ones. He can write almost all of his uppercase letters too. Can write his name with no help from me (not even spelling it). And he can spell almost any word I spell for him. He still struggles with S, and probably a few more that don't come up in words very often (like K and Z). Can count to 20, though he still sometimes gets confused in the teens. When describing a friend, I told him she had blonde hair. He asked what that meant. Me: Well what color hair does Grandma have? What letter does lion start with? Okay, what letter does bear start with? Me: You can't have them for breakfast, you can have some with lunch. Noah: Because daddy's at work. Noah: No, I want to wash it at home with daddy. Not you. Me: Can I take photos? Noah: No. You go inside. You can watch one of your shows. I'll tell you when we are done. Just recently started saying "meeny miny moe"
He likes to play the "repeating" game where he repeats EVERYTHING I say! It's very annoying and not a phase I enjoy. Foods - hard boiled eggs, plain pasta, grilled cheese (when I make them), "dinosaur" chicken nuggets. Dannon yogurt smoothies (monkeys), Gogurts, smoothies, string cheese. Banana bread, apple zucchini muffins, oatmeal chocolate chip cookies, Rice Krispies treats, Nilla wafers, Skittles. Carrots, cucumbers, honey dew, cantaloupe. Chocolate milk is his preferred drink now (even over apple juice). Used to love vanilla ice cream and just a week ago switched to chocolate! Preschool, swim, soccer. Going to the playground, riding his bike, drawing with chalk, the stomp rocket! Bubble baths, his iPad, playing with daddy, board games, playing "I spy" in the car! His best buds... JP, Eli, Owen, his cousins! In the last update I mentioned that he disliked baths and preferred showers. We've switched back to liking baths and I can't remember the last time he took a shower! Loud things, getting dirty, things out of place. Wearing jeans or pants without an elastic waist... basically any pants other than sweatpants. Tags. He no longer naps. He usually goes to bed anytime between 7 and 9 and wakes up around 6:30. Is now officially potty trained. We did it back in February and it went really smoothly... way easier than I expected! He still wears a diaper at night but he's even good at that too. He often wakes up dry and will even wake up in the middle of the night telling me he needs to use the toilet. He is struggling with using the bathroom at school. Most of the time he holds it, but twice he had an accident. He often complains that things are too loud. He doesn't like when the blender is on. He sometimes says he doesn't want to go somewhere or didn't have fun because it was "too loud". He loves swim class. He wears goggles now (since March) and is really good at holding his breath and putting his face under water. He's even starting to lie on his stomach and kick while doing it! He just started soccer and loves it! Happy Half Birthday Noah!!! May the next 6 months go by slowly! You went all out with the candles and sweets. I gave Connor some new toys and that was about it. I think it goes without saying these little misters sure are loved. Yay for all the new independence! Getting in & buckling their own car seat is one of my favorites!!! He is so funny and so cute. You got a VERY good one Meghan. I love that you made a big deal out of the half birthday too. So special. Side note I guess I never realized how close Connor and Noah are in age. I bet those two would have the BEST time together. Love that you do posts like this for him! It's fun to celebrate the little things and commemorate. I especially commend you for all the detail you're recording his likes/development etc. He will love to read that some day! "No. You go inside. You can watch one of your shows. I'll tell you when we are done." That cracks me up! He's so sweet! 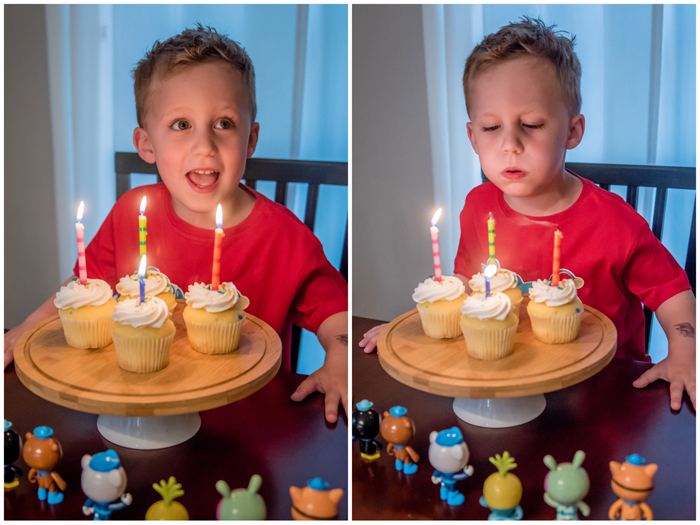 happy 1/2 birthday! I love the things he says. Such a cutie! "Then I want lunch now." Haha! He's a smart one! What a sweet boy! XOXO I love the first picture! Happy half birthday Noah! I love all of these photos of him and I am dying over the things he says. Kids are awesome!! Happy half birthday sweet boy! He's looking like such a big boy these days... time slow down! 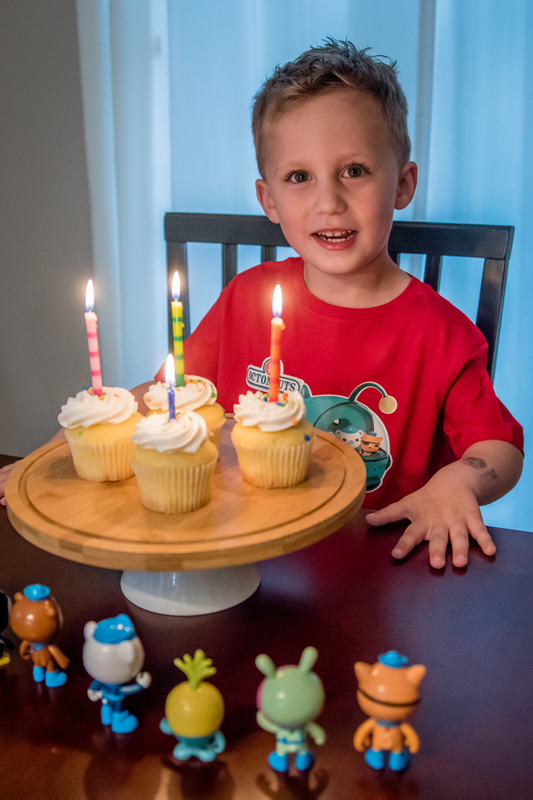 I love that he set up his Octonauts to help since happy birthday!